Kendrick Lamar and DJ Khaled were honoured with prizes at Variety magazine's inaugural Hitmakers event on Saturday (18Nov17). The Alright singer was named the recipient of the Variety Hitmaker of the Year Award at the event, which was held at the Sunset Tower Hotel in Los Angeles on Saturday afternoon to celebrate the launch of the magazine's first music franchise, titled Hitmakers. "I've been doing this for a long time, since I was 13, 14 years old," he said when accepting the award. "To hone in the title of a hitmaker means a lot because we put a lot of time and a lot of effort (in the studio). "I thank each and every one of you for allowing me to evolve and let me make these weird a*s songs that y'all like. These songs represent me and who I am. I want to continue to push that envelope and hopefully I continue to have y'all ears to do so." Wild Thoughts producer DJ Khaled was honoured with the Mediabase PowerPlaylist Award, and during his speech he detailed how he scored collaborations with the likes of Justin Bieber, Rihanna and Chance the Rapper. He added, "Every time I see Kendrick, I'm sure he'll tell you, I whisper in his ear and say, 'I got something for us.'" The final honoree was actress and singer Hailee Steinfeld, who received the Variety Crossover Artist Award, and said the recognition was "a real moment of validation and a personal realisation that I am accomplishing what I set out to achieve a very long time ago." 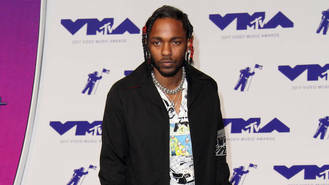 Both Kendrick and DJ Khaled could end up with more awards by the end of the weekend - they have both been nominated in multiple categories at the American Music Awards (AMAs), which take place on Sunday at the Microsoft Theater in LA. Hailee will also be at the ceremony to perform her song Let Me Go, her collaboration with Swedish DJ Alesso, country group Florida Georgia Line, and singer Andrew Wyatt.